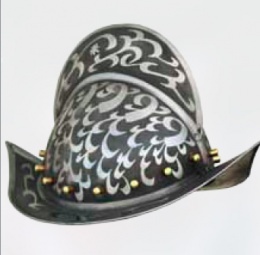 Although the morion is most commonly associated with Spanish conquistadors, it was also often seen on European foot soldiers. They were even used by the English during the reign of Edward VI. Our Spanish Comb Morion (Engraved) Helmet is certainly one of great beauty. inspired by one that nobility would have worn in the 16th century, as they were the only ones who could afford the luxury of having their morion decorated. This page was last modified on 13 May 2014, at 13:43.